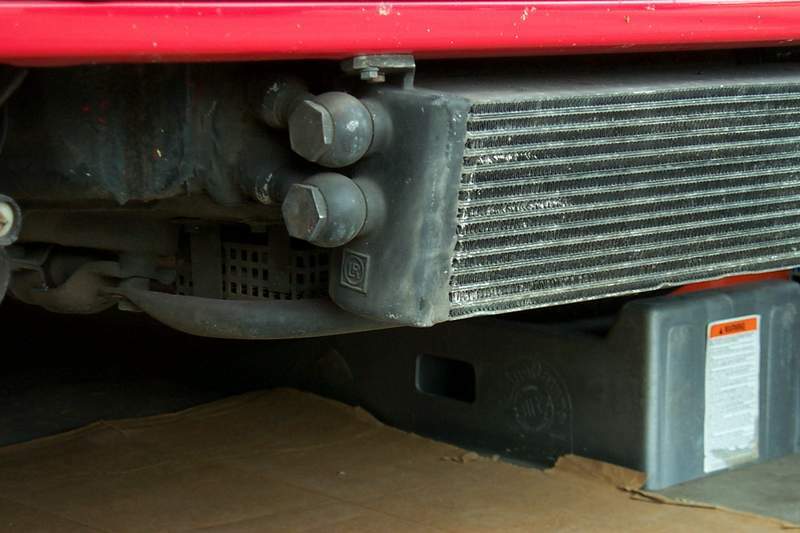 I have an old early '80's front cooler mounted in the spoiler, approx. 6"x13". The engine temps are 200-210 range. While this is fine for street driving, I know it won't work for the occasional track days. Are most coolers about the same in efficiency, or are some better than others? I boxed the back of the cooler so it ducked out the bottom of the car instead of hitting the body behind the cooler, but didn't make any difference temp wise. The car is a slantnose so I can't add a fender mounted cooler. 200 - 210 is not bad. I ran the 28 brass cooler in the front passenger fender for years with an occasional 240* at the track; then mounted a Setrab behind the front valance connected in series with the fender one. Temps don't go over 200 anymore whatever I do at the track; however, no major improvement in traffic. 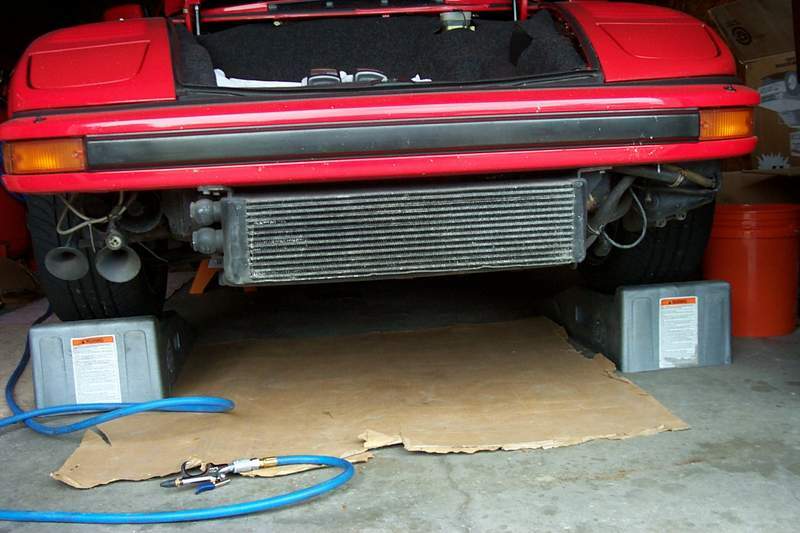 Im setting up to run twin 964 oil coolers in the front of my car, Ruf used this setup (I think)and I think it is a great idea. Check out Fluidyne's website. I use an airbox650 and in FL (HOT) my car always stays around 178°F. A good source to buy their coolers is from Hoerr Racing Products. Now I must mention that these coolers come with -12 AN in and out but I cut them off and replaced them with -16 fittings. The -12's will work fine but for my setup I needed the larger line. I've seen remote oil filter adapters that install where the engine oil cooler mounts on the engine for those who use external oil coolers, does anyone know where i can source one. I just had one installed on our 3.4 race motor at Jerry Woods. They carry the kit. They estimate this may increase your oil temp by 30-40 degree. I have a nice sized front cooler. Great, Smart Racing Catalog shows them, Thanks! what`s the purpose of a mod that increases oil temp? I see it as extra filtering, if anything did let go in your engine it would stop there. The factory Special Wishes cars in the early to mid-80's had the front mounted oil coolers that were a bit over engineered for the street. Lots of flow. So who sells the nicest bolt-on front cooler kits? My opening is 23" x 6". This one from Setrab looks pretty nice. While these coolers seem fine for the street, how are they on the track? Not sure one cooler is enough. 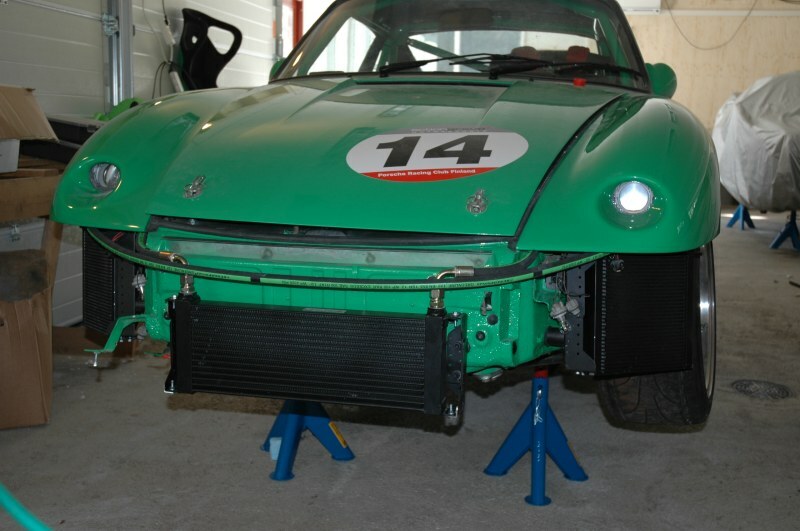 I run twin fender mounted carrera coolers on our 3.4 n.a. race car which work fine. The temp stays around 190-200, even in 100+ degree weather. I've got the same one as Dave (Werk-l) has pictured.... a very sturdy unit with no cooling issues. Is there a company out there offering a plug-N-play front oil cooler kit? I'd rather not mess around sourcing fittings and making brackets. 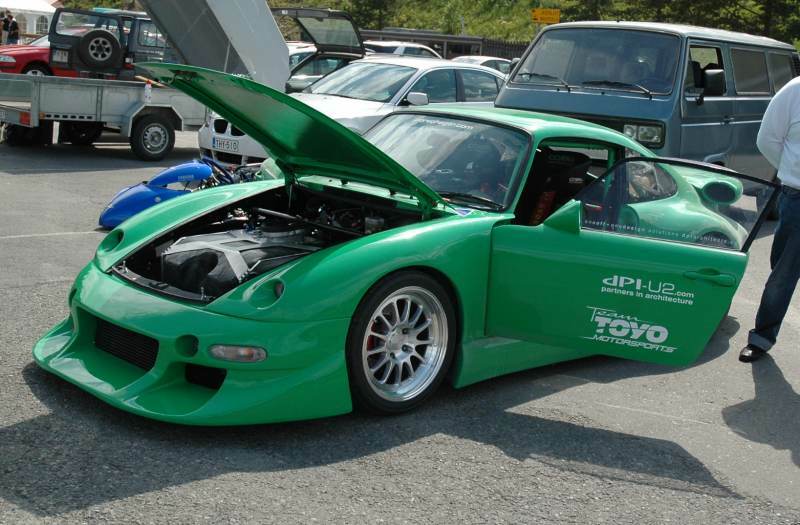 I had a strong heating problem in track days in my Green one (also street legal), even if no problem at all when at street. Note, since the photo has taken, the oil lines has changed douple that wide (interior measure of the line always more than 18mm, the bigger the better) to make sure that oil pump doesn't cavitate and get broken. The final system is very satisfying :D. No heating problems whatsoever hard I push :D:D.
In my 3,6 natural aspirated "RSR" I have similar front cooler than you have in slant nose pics, and that car runs all the time in the track just slightly below the red line. That particular car will get next winter 2 x 964-coolers to corners as an addition to act together with the center cooler to make sure I wouldn't blow the engine or kill the oil (Valvoline Racing VR-1 10-60) too fast. didnt have to make tabs for the body, bolted through fender and ran aeorquip lines. I also use fluidyne coolers - one in each front wheel well and no engine cooler. A couple of weeks ago, at a Road Atlanta DE, the ambient air temp was 96, track temp of 115 and my oil temps hit 230. Around town, it never moves from 185 (engine temps measured by the ECU). However, they require some fabrication to fit.